Queen Room Private access to house via front verandah. Exclusive access to queen bathroom with toiletries and hairdryer. Linen, bath towels and beach towels provided. Air conditioning and ceiling fan. Bar Fridge and Tea/Coffee set. Access to main kitchen facilities and barbeque (BBQ). Free WIFI internet access. TV, DVD, CD player. Tropical Breakfast is included in the Room rate. King Cottage Exclusive Cottage with private access. En-suite bathroom, toiletries and hairdryer. Linen, bath towels and beach towels provided. Air conditioning and ceiling fan. Kitchenette, Microwave and Bar fridge. Private courtyard, outdoor seating and barbeque (BBQ). Free WIFI internet access. TV, DVD, CD player. Tropical Breakfast is included in the Room rate. South Pacific Bed & Breakfast is just 2 minutes' walk from Clifton Beach. Featuring a lovely outdoor swimming pool, free breakfast and free Wi-Fi, guests can explore the local area with free bicycle hire. Each air-conditioned room includes a TV, a DVD player and a CD player. Fresh towels and comfortable linen are also provided. The private bathroom has a shower and a hairdryer. Some rooms have a patio, outdoor furniture and a kitchenette with a refrigerator. Your delicious breakfast includes cereal, seasonal fruit, toast, baguettes, honey and jam. Freshly ground coffee and local Daintree tea and juices are also available. After a busy day, guests can relax with friends on the large deck with views of the lush tropical gardens. The property also offers free kayak hire, 2 free bicycles and free BBQ facilities. 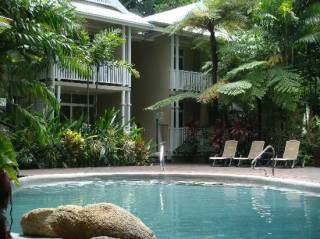 South Pacific B&B is a 5-minute drive from Cairns Tropical Zoo and a 10-minute walk from Palm Cove, with a variety of restaurants and boutique shops. 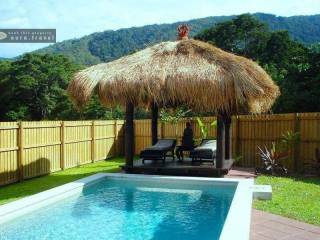 Cairns International Airport is a 25-minute drive away, and Mossman Gorge is a 45-minute drive. Peaceful setting, private accommodation and tranquil atmosphere. 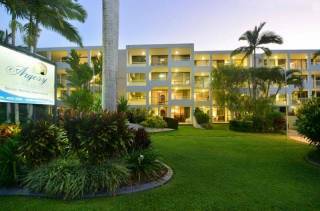 Embraced by ferns and palms with views of the beach 50m away. The ocean can be heard lightly in the background and you can be walking through the sand within moments. Arise from a peaceful sleep, enjoy a majestic sunrise walk along the palm lined beach or relax on the deck watching the ocean while enjoying a Tropical breakfast. When in season, we welcome guests to try the coconut water, fresh from our very own tree. 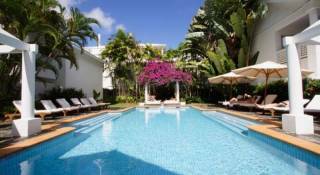 Take a swim in our fresh water pool surrounded by palms and ferns. Relax on the large deck or in one of the three tropical gardens. Stroll along the beach or swim in the sea. If you are a romantic then we can help arrange a sunset setting on the beach for that special moment. Perfect for couples wishing to enjoy time in paradise. The atmosphere is warm and inviting with an eclectic attitude. There are numerous locations and settings where a couple can relax and enjoy each others company in this restful and peaceful environment. The region is a wonderful playground with something for everyone to experience. There are a myriad of adventures to find in and around Cairns. 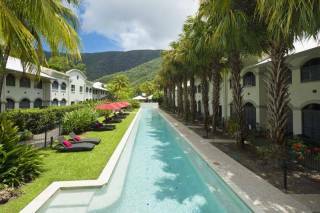 Located just 20 minutes from Cairns International Airport we are central to many attractions. Children: Child bed only available in King Cottage. Babies: Babies welcome but no bed provided. Please bring your own bed and bedding. Tropical Breakfast of cereals, seasonal fruits, toast and croissants with honey and jams. Freshly ground coffee, local Daintree tea and fruit juices. If you require a special diet or an Asian breakfast, please mention when booking with the Special Requirements entry, or after booking using the Contact Form. If cancelled or modified up to 28 days befored date of arrival, no fees will be charged. If cancelled or modified later or in case of no-show, 50% of the total price of the reservation will be charged. 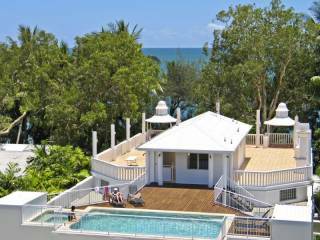 South Pacific BnB Clifton Beach is approximately 20-25 minutes drive (23.3kms) by car fromCairns International Airport. Limousine service pickup from the Airport in the family Jaguar may be requested upon application with the contact form below. Airport Transfers $25 AUD per journey. Please request additionally when booking and kindly provide flight number, date and time of arrival/departure as soon as possible. Subject to availability and circumstances for all parties at the time of arrival/departure. We will do our best in accommodating you. – If traveling on the 110 Bus from Cairns, please get off at Deadmans Gully, at the corner of Endevour Road & Upolu Esplanade. – Continue North along Upolu Esplanade (with the beach on the right) & turn left into Gibson Close, then turn right & continue to the end of the culdersac on the right. 260m – Turn left into Gibson Close. 100m – Turn right and proceed to the end of the cul-de-sac. South Pacific BnB Clifton Beach is the white homestead on the right. Please park in the space to the left & we look forward to welcoming you.